So many people today dream of wealth. Young developers earning millions from startups. Successful business owners and investors acquiring astronomical levels of personal net worth. Rule No. 1 is that you have to establish a belief in something more important than wealth itself. So often we fall for the enticing Siren song that being rich will solve all our problems. “If I only had a million dollars,” we think to ourselves, and daydream about how money would wisp away our troubles and worries. I’m not suggesting that money isn’t important. It is extremely important and can be very empowering. But believing that becoming rich in and of itself is our panacea misses the point. “Rich” is not a destination. Anyone who makes it his or her life’s pursuit to “get rich” will find the accomplishment empty and hollow. Some of history’s wealthiest men understood this principle very well. When he was 33, Andrew Carnegie wrote a note to himself in which he took an inventory of his life, where he had been and where he wanted to head. He calculated that he had a net worth of nearly $75 million and an annual income of almost $10 million. Among the insightful lessons he penned to himself in that note of self-inspection, he acknowledged the worthlessness of amassing wealth in and of itself. “No idol more debasing than the worship of money,” he counseled himself, while committing to devote his efforts to pursuits he felt would most benefit society. To understand what those causes and pursuits should be, we look to Rule No. 2. Rule No. 2 is that you have to seek wealth to help others. In short, you must be generous with your wealth. However, and extremely importantly, you must begin being generous today, even before you are wealthy. Yachts, world travel, summer homes — these may all be fun and exciting for a time. But truly rewarding, meaningful experiences will come from wealth only when you use it as a tool for helping others. In his well-known article “The Gospel of Wealth,” Carnegie explained that an individual with wealth should merely see himself as a trustee of his surplus means. After providing moderately for himself and his dependents, he should administer his surplus “trust funds” in a way he judges best for the community. Carnegie himself committed to giving away his entire fortune over the course of his life. Many of today’s wealthy have followed a similar path, admirably using and committing a majority of their wealth to further causes they judge to be worthwhile. While much of the help and generosity you provide through wealth can come through charity, much good can come through providing meaningful opportunities for progress and growth through work. I listened recently to the widow of a very successful businessman explain how she and her deceased husband felt they had a responsibility in their businesses to pay a wage high enough to allow a single working parent to provide for his or her family. I personally feel very grateful to employers who have allowed me to provide means for my family through the employment opportunities they’ve made available. In charity and employment, you must be generous. A crucial part of Rule No. 2 is that you must begin developing this character of generosity and charity now, even if you aren’t yet wealthy and don’t have much surplus. A dean of one of the world’s top business schools once asked a group of students if they could guess what the top indicator was to him of whether an alumni would ever donate to the school’s alumni fund. It wasn’t the job the student pursued. It wasn’t any title or honor ultimately attained by the student. And most surprisingly, it wasn’t how much wealth the student accumulated. The number one indication, the dean explained, was if the student had contributed to the school before, and how recently. The same insight applies to generosity with wealth — if you don’t begin today to develop traits of generosity and charity, you’ll struggle to give to others even if one day you are wealthy. If you don’t begin today to develop traits of generosity and charity, you’ll struggle to give to others even if one day you are wealthy. Rule No. 3 is that you have to desire to be wealthy. Believe it or not, being wealthy actually isn’t a desire for some people. The desire to be wealthy, however, must be understood within the context of the other rules. DO NOT seek wealth for the sole purpose of being wealthy. Make sure you’re seeking it for the right reasons, as described in Rule No. 2. Once your motives are correct, you will have to desire to be wealthy to become so. And that desire translates to working for it. It will very unlikely flow to you out of nowhere. Seeking wealth does not involve heading for Vegas or playing the lottery. Seeking wealth takes time and continued efforts to attain. You are very unlikely to get rich overnight. Wealth comes by degrees. We love to focus on the watershed moments of life when an individual appears to suddenly become very wealthy, like when a startup announces it’s being acquired for $1.5 billion with million dollar payouts to founders and early employees. We see the big announcement, but we don’t see the years, maybe decades, of small steps, daily efforts that led to a very big payday. Instead, we wish we could start a company that could get acquired for a billion dollars next week, or if we’re feeling more realistic, maybe a month or two from now. Seeking wealth means being willing to learn from experience — that is, by getting it wrong sometimes — and to establish a pattern of perseverance. It means being unafraid to switch, make course corrections, and move outside of our comfort zones as we work toward our goal. The last rule is Rule No. 4: you have to learn to manage well what you have. The journey of a thousand miles starts with a step. In the context of becoming wealthy, if you aren’t able to wisely manage $1k, $10k, or $100k, you also won’t be able to manage $1M. Again, we too often find ourselves waiting for the big moment in life when we’ll be rich, at which time we’re sure we would start to wisely manage our finances. We should instead start today, wherever we are financially, to manage our resources. Many people struggle with money management because we never really learn how to do it. We open a bank account, get a credit card, set up a profile on Mint and we’re set, right? On the contrary, to accumulate wealth, you need to spend time on a regular and frequent basis understanding your spending habits, financial obligations, and money inflows and outflows. I hope knowing and living by these four rules will help you find success in the pursuit of your financial goals. 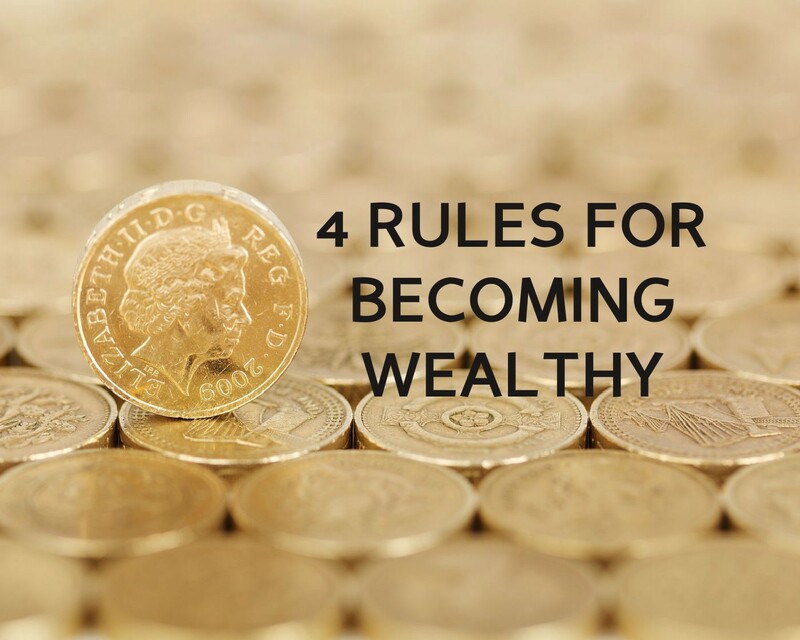 If you like the 4 Rules For Becoming Wealthy, please recommend this article and share the rules with others. It’s just one way to start today to follow Rule No. 2. David Nasaw. Andrew Carnegie. Penguin Press, 2006.